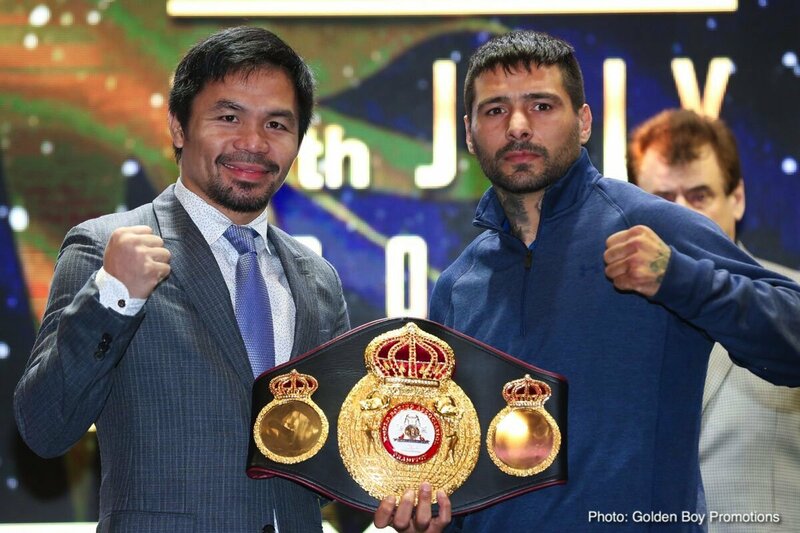 For quite some time now, promoter Bob Arum was telling everyone he was quite doubtful the scheduled July 15 fight between WBA welterweight belt-holder Lucas Matthysse and Manny Pacquiao would actually go ahead. Arum was sceptical the money would be there for the fight; and the Top Rank boss was even looking at having Matthysse face Terence Crawford if the fight with Manny did fall through. Now, as per a story on ESPN.com, any and all concerns over the Kuala Lumper fight have been put to rest. The money owed to Matthysse has been placed in his account in escrow and the fight is most definitely on. The Argentine puncher is set to fly out to Malaysia on Tuesday. So now that the fight is on, what can we expect? Who has the most left – 35 year old Matthysse, 39-4(36) or 39 year old Pacquiao, 59-7-2(38)? The fight is a big deal in Malaysia and big ticket sales and fan attendance are expected. For US TV fans, ESPN or ESPN+ will show the Regis Prograis-Juan Jose Velasco fight from New Orleans first and will then go over live to the Kuala Lumper fight. With a stacked card scheduled for July 15 in Malaysia it should be quite a night of fights. Will we see the end of the great Manny Pacquiao, or will the living legend win yet another title?